MADRID --- Airbus Defence and Space has successfully demonstrated automatic air-to-air refuelling (AAR) contacts with a fighter aircraft from a tanker’s refuelling boom – the first time in the world that this has been done. 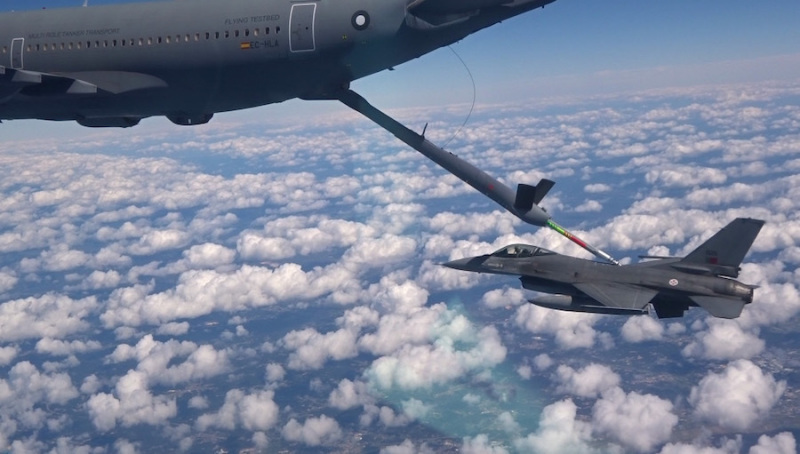 Airbus’ A310 MRTT company development aircraft performed six automatic contacts with a F-16 of the Portuguese Air Force in a demonstration of a technique which the company believes holds great promise for enhancing in-service AAR operations. The system requires no additional equipment on the receiver and is intended to reduce boom operator workload, improve safety, and optimise the rate of AAR in operational conditions to maximise combat efficiency. It could be introduced on the current production A330 MRTT as soon as 2019. Initial approach and tracking of the receiver is performed by the tanker’s Air Refuelling Operator (ARO) as usual. Innovative passive techniques such as image processing are then used to determine the receiver’s refuelling receptacle position and when the automated system is activated, a fully automated flight control system directs the boom towards the receiver’s receptacle. The telescopic beam inside the boom can be controlled in a range of ways including: manually by the ARO; a relative distance-keeping mode; or full auto-mode to perform the contact. The imaging technology underlying the Automatic AAR technique was originally used by Airbus’ Space division to develop solutions for refuelling satellites in space or for space debris removal and was further developed and applied by Airbus Defence and Space’s Incubator Laboratory for the tanking application. The Airbus Defence and Space A330 MRTT is the only new generation strategic tanker/transport aircraft combat-proven and available today. The large 111 tonnes/ 245,000 lb basic fuel capacity of the successful A330-200 airliner, from which it is derived, enables the A330 MRTT to excel in air-to-air refuelling missions without the need for any additional fuel tank. The A330 MRTT is offered with a choice of proven air-to-air refuelling systems including an advanced Airbus Defence and Space Aerial Refuelling Boom System, and/or a pair of under-wing hose and drogue pods, and/or a Fuselage Refuelling Unit. Thanks to its true wide-body fuselage, the A330 MRTT can also be used as a pure transport aircraft able to carry up to 300 troops, or a payload of up to 45 tonnes/99,000 lb. It can also easily be converted to accommodate up to 130 stretchers for Medical Evacuation (MEDEVAC). To-date, a total of 51 A330 MRTTs have been ordered by nine nations (Australia, France, Luxembourg, Netherlands, Saudi Arabia, Singapore, South Korea, the United Arab Emirates, and the United Kingdom), with two (Australia and Saudi Arabia) having already placed repeat orders.